Going Green Tips for Great Lakes Marinas – and You! 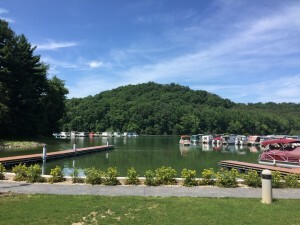 Last month, the Ohio Clean Marinas Program hosted a webinar for Great Lakes marinas on the topic of native landscaping. Experts from the Ohio Department of Natural Resources – Division of Natural Areas and Preserves, Good Nature Organic Lawn Care, and the Cuyahoga Soil and Water Conservation District were brought together to discuss native plant options, an introduction to organic lawn care, and best practices for non-toxic cleaning. While this content was targeted towards marina owners – especially our certified Clean Marinas in the Great Lakes who are actively taking steps to protect water quality – I was amazed at how much of it is applicable to homeowners, communities, and business owners alike. Did you know that 22% of Ohio’s plants are invasive (i.e., non-native), and that there is a Go Native website to help you find native alternatives? Or that your lawn will receive 30% of the nitrogen it needs by mulching instead of bagging your grass clippings? How about this one: a mixture of vinegar, water, and a bit of dishwashing liquid makes a great non-toxic weed killer! All of these practices are encouraged for environmental purposes, but they also have social and economic benefits. By planting native plants and rain gardens, you improve habitat for wildlife, aid in stormwater runoff, and often improve the aesthetic appeal of your lawn by adding flowering plants and shrubs where grass once was. Organic alternatives to traditional lawn care benefit wildlife and water quality while creating a safer yard for pets and children. Replacing toxic cleaning products with home-made alternatives is better for you and the environment without compromising on effectiveness or draining your pocketbook on expensive chemicals. For more great tips and information and to see our Great Lakes Clean Marina Boat Cleaning Best Practices tip sheet for recipes on non-toxic cleaning products (useful on your boat and around your home! ), I encourage you to watch the webinar recording! Sarah Orlando is the Ohio Clean Marinas Program Manager, Ohio Sea Grant College Program.